I think I say "yay" all the time because a) it's just a fun word and b) it seems like such a nice way to congratulate someone! "Yay" feels happy and genuine, as in "I'm happy for your happiness". I think we could all use a little more "yay" right now. I used the negative cut of "yay" to make a window/aperture on the front of my card, along with a party hat from Celebration Lady set. And did you know that you can use Copic markers to custom color white pom-poms? The positive cut of the letters are also fun to play with. I cut two words from cardstock I had inked and then coated one with Glossy Accents and one with Nuvo White Blizzard glitter drops. This is one of my favorite ways to dress up die cuts and to keep myself from mucking it up before it dries, I place a loop of low-tape on an acrylic block. I stick my die cuts into the tape and apply the Glossy Accents or Nuvo. Then I set the block very, VERY far away from myself to dry. Thanks so much for stopping by! Have fun on the rest of the hop and your next stop is my friend Carolyn Peeler's blog. Awesome tip for applying glossyg accents etc. to die cuts. Thank you! 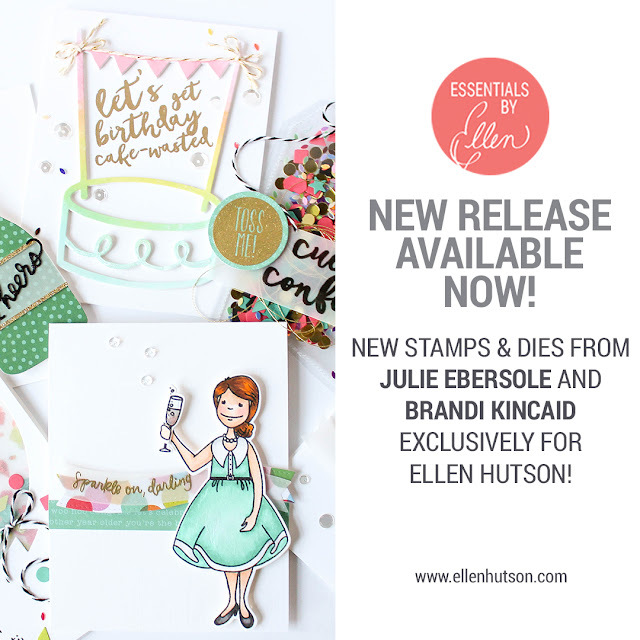 Such a fun new release! I use the word Yay all the time also. Thanks for your idea on letting glossy accents and things dry. I'll try that!! Love how the Nuvo drops look on top of the YAY! A very fun and festive new release! Cute cards! Love these new products and your cards at super nice! thanks for sharing. So in love with your clean graphic style on these cards! Sweet cards and awesome tip on applying glossy accents, etc. Cute and festive card designs. Such a cute idea of putting the party hat inside the “A”: great cards. Love your cards. Thanks for the great tip. Great release. Thanks for sharing so many great tips. Love your card designs. Wow, great tips and cute card! YAY! indeed, Carly! LOve every project and your genius technique for coating your die cuts using glossy accents - Far, far away, is the best for me, too! The cards are so so cute! I am in love with the Cue the Confetti Collection!!! The party hat in the "A" is pure genius. Love it! So festive! Love the colors! Great looking cards. Simple and so effective with the big YAY! I like the texture you get with the Copics colouring tip and mounting your diecuts on tape. Thanks. Yay, Yay, Yay!!! Great and festive cards and love the 3D look of using the Crystal accents!